Updated final home and away ladder simulations appear below. Only nine teams are now expected to win 12 games or more in the regular season, with GWS in 4th now separated from Melbourne in 8th by only 0.7 Expected Wins. Nine teams are now assessed as better than even-money chances for a spot in the Finals. Three teams now (one more than last week) have better than even-money chances for a place in the Top 4. Five teams have between 16% and 38% chances. Percentages remain a likely factor in separating teams in a number of key ladder positions, as we can see from the chart below. It shows that, for example, there's an estimated 49% chance (up 6% points from last week) that the team in 9th will be separated only on percentage from the team in 8th at the end of the home-and-away season. There's also about a 9% chance that 6th and 9th will all be equal on wins, about a 41% chance that the teams in 4th and 5th will finish equal on wins, and about a 27% chance that the Minor Premiership will be determined by percentage. Teams dominating really need to be putting the foot down for the rest of the season. This week's Gini concentration measures appear below, and reflect the level of certainty in our knowledge about which teams will finish where at the end of the home and away season. For information about how to interpret these measures, you can see this blog, but the table at right might also help. It shows the Gini coefficient that a team would have if it were equally likely to finish in any of a specified number of ladder positions (and in no other position). So, for example, a team that was equally likely to finish in any of six ladder positions would have a Gini coefficient of 0.667. This week, as we'll see in a moment, North Melbourne has a Gini coefficient of 0.643, so we can think of the level of uncertainty it has about its final home-and-away ladder position as roughly equivalent to that for a notional team that found itself equally likely to finish in any of six ladder positions. Note that we're not saying that North Melbourne is only capable of finishing in six different ladder positions (it can actually finish in any of 15 different positions, 11 of them with an estimated probability of 1% or more), just that the uncertainty it faces it roughly equivalent to a team in that situation. 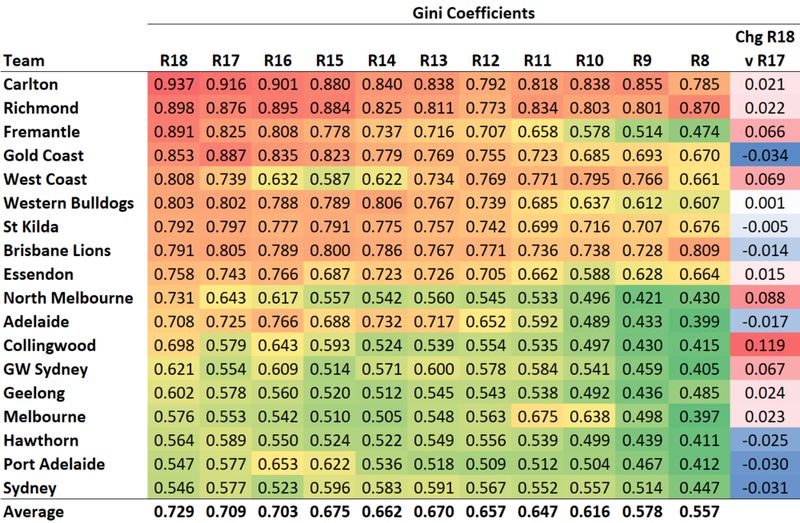 You'll note that a team equally likely of finishing in any of the 18 ladder positions will have a Gini coefficient of 0, but one that is absolutely certain of its final ladder position will have a Gini coefficient of 0.944, not 1. There's a technical reason for this - and a 'bias correction' we could apply to all coefficients to force the range to be (0,1) - but for our purposes, the uncorrected coefficients are fine. Seven teams became less certain about their final ladder positions this weekend, especially Gold Coast, Sydney, Port Adelaide, and Hawthorn. Sydney is now the team whose final position is least certain. They have a 5% or greater estimated chance of finishing in any of the positions from 3rd to 12th, and a 10% or greater estimated chance of finishing anywhere from 5th to 10th. Overall though, certainty was on the rise, with the average Gini coefficient rising by almost 3%. Carlton remain the team with the highest level of certainty about their ultimate ladder finish, with an estimated 94% chance of finishing 18th. Richmond are next-most certain, with an estimated 72% chance of finishing 1st. As a neutral observer, you couldn't ask for much more than the fact that, with five rounds to go, least certainty is associated with positions 3rd through 10th. Most uncertain of all is 9th place, for which nine teams have estimated chances of about 7% or higher of eventually filling. Next-most uncertain is 8th spot where eight teams have estimated chances of about 7% or higher. Across all 18 ladder positions, the average decrease in uncertainty this week is similar to that we saw for the team-based view (viz just under a 3% increase in the average Gini coefficient). Below are the updated estimates of teams' likelihood of making the Finals depending on the number of wins that they record. 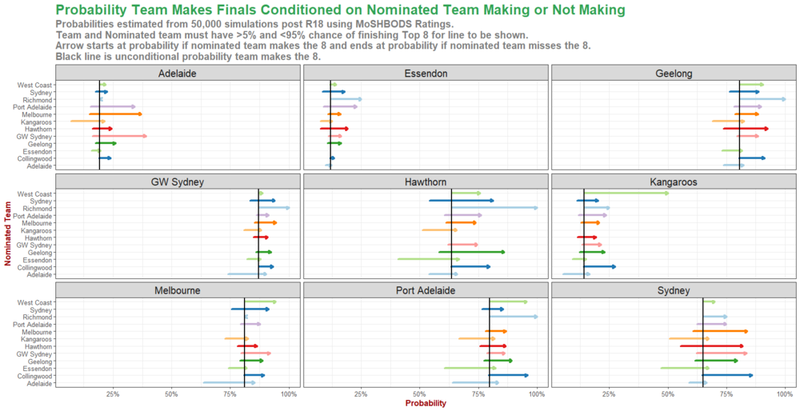 Geelong and Melbourne remain the teams most likely to make the Finals should they finish on only 12 wins, but the estimated conditional probability of them doing remains under 50%, especially for Geelong. Amongst the remaining teams, only Hawthorn has a better than 25% chance of playing Finals after recording just 12 wins. Thirteen wins makes all teams about 75% or better chances for a finals berth. 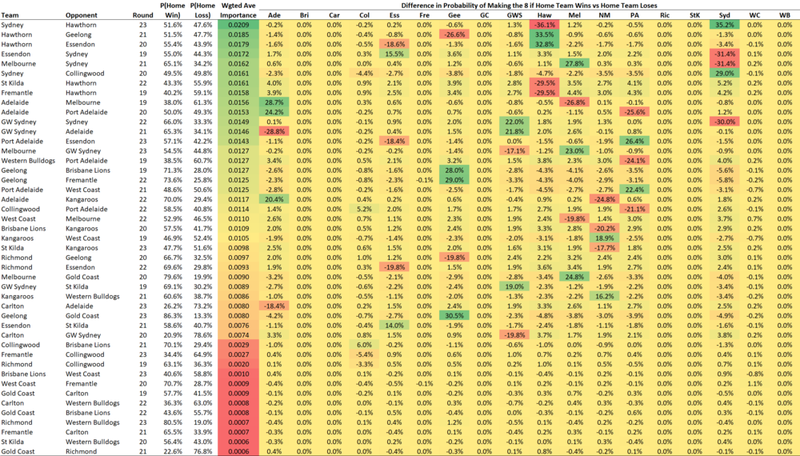 Looking next at the analysis for Top 4 finishes, we find that Richmond and Melbourne remain the only teams with better than even-money chances of finishing in the Top 4 with only 14 wins. These are the teams whose percentages are the highest in the competition. Sydney and Port Adelaide are now both less than 25% chances of finishing Top 4 with only 14 wins. They also have the lowest (though still around 90% or higher) chances of finishing Top 4 with 15 wins. 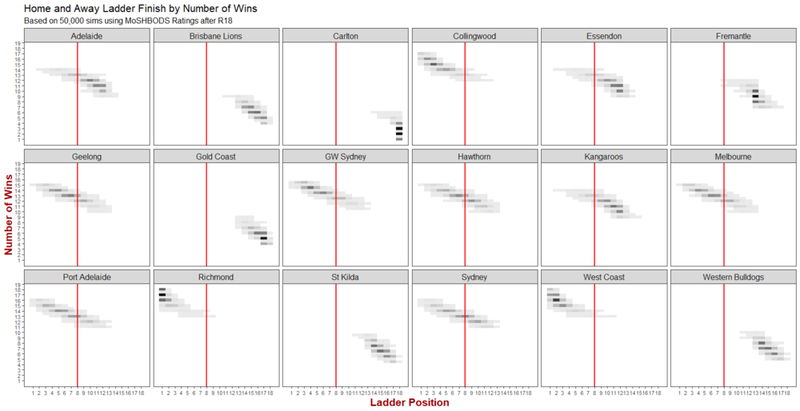 Looking at the relationship between every possible ladder finish for a team and the number of wins that team records we still see still quite wide ranges of relatively plausible finishes for a number of teams given a specified number of wins - say Geelong, for example, with 12 or 13 wins, or Port Adelaide with 13 or 14 wins. A similar analysis, aggregating across teams, gives us an idea of the overall spread of likely ladder finishes for teams with a specified number of wins. We see that, even moreso than last week, 13 wins is more often associated with 8th spot than is 12 wins. Also, 14 wins is more often associated with 4th spot than is 15 wins. 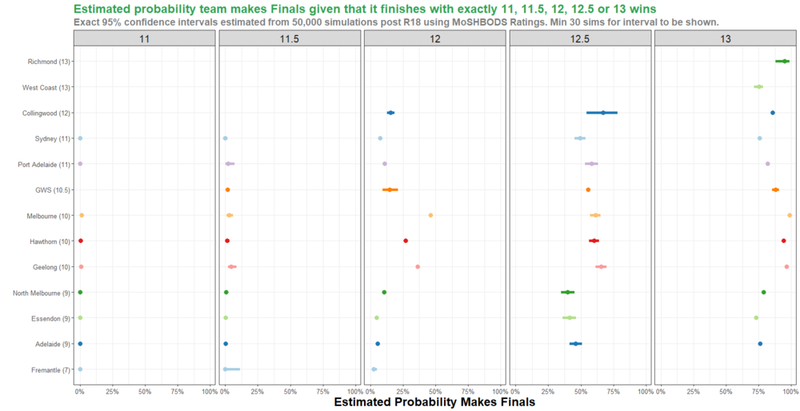 Next, we explore the inter-team dependencies in the composition of the final 8 by estimating the probability that a particular teams makes the 8 conditioned on some other team making or missing the 8. These are shown in the charts below, as usual, as arrows with the base of an arrow marking the estimated probability that a team makes the 8 conditioned on a nominated team missing the 8, and the arrow head marking the estimated probability that a team makes the 8 conditioned on a nominated team making the 8. The magnitude of the arrow lengths in the chart denotes the extent to which one team's chances are linked to another's, and the number of relatively long arrows reflects the general level of dependence. We see this week the increased number of teams whose fate depends fairly heavily on that of other teams. We can do the same analysis for positions in the Top 4, which we do below. Here we find the highest levels of dependence across a range of teams for Collingwood, Geelong, GWS, Melbourne, and Port Adelaide. Below are the updated estimates of game importance, now shown for all remaining games in the fixture, and calculated on the basis of the game's expected impact on all 18 teams' finals chances. The top three games, and five of the top eight, all involve Hawthorn, while Sydney is involved in four of the top six. There are three of the Round 19 games in the top nine: Essendon v Sydney, Fremantle v Hawthorn, and Adelaide v Melbourne. In the next and final table we have the estimated importance of each remaining game to the composition of the Top 4. Here we find that GWS are involved in three of the top five, and Sydney and Collingwood in two of the top four each. 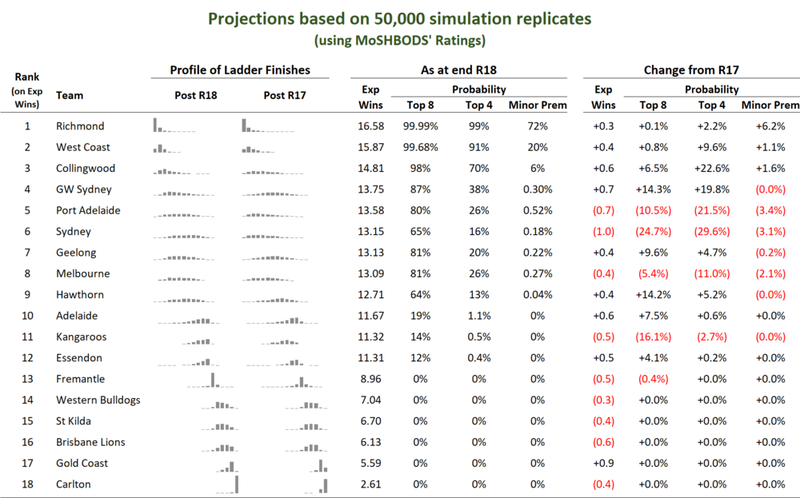 From this week's games, only the GWS v St Kilda game appears in the top ten, but that's partly because of the higher levels of uncertainty used in the season simulations, which boosts St Kilda's chances considerably.